Recipe from Holly Clegg's Too Hot in the Kitchen: Secrets To Sizzle At Any Age. 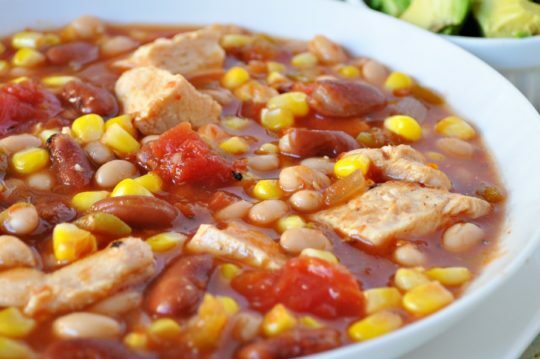 If you have salsa, kidney and navy beans, and chicken, then what could be better than a chicken chili? Serve with reduced-fat cheese, avocado and onions. In large pot coated with nonstick cooking spray, season chicken and cook until lightly browned, 5 minutes. Add salsa, tomatoes, broth, green chilies, oregano and cumin. Bring to boil, reduce heat and cook 15 minutes. Add corn and beans, cooking another 5-10 minutes until well heated and bubbly. Serve with condiments. This recipe makes 10 (1 cup) servings.